I’ve been busier with work the past couple weeks, which is good, but it also means more time away from my food blog (and I’m pretty bummed I missed the Recipe Redux for this month!) I usually spend about 2-3 hours creating a post, sometimes more, depending on the topic, photos, and the ease or difficulty of writing it. 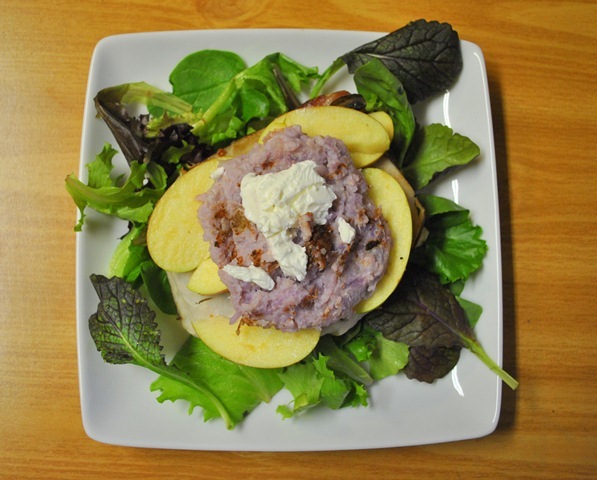 Here is a recipe that I recently experimented with, and it’s all thanks to an Apple and Fennel salad I came across at Wegman’s. It was tart, vinegary, and sweetened with a sprinkle of golden raisins. I loved the combination of flavors and thought this would be great to serve alongside the richer Thanksgiving dishes (and it did!) But instead of ordering a couple pounds of this delicious stuff, I thought I’d come up with my own version of this tart n’ tangy palate-cleansing dish. Simple is Best – All you need is six ingredients, super easy! 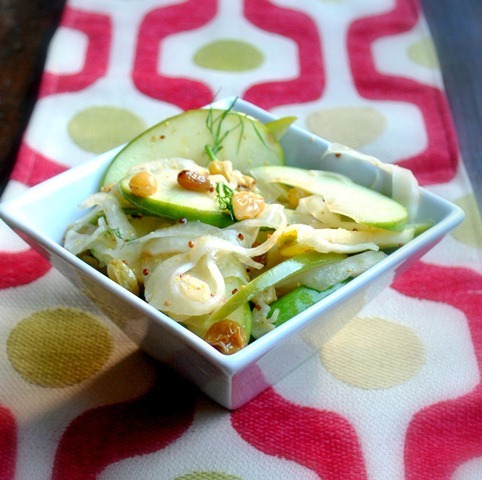 Tasty and Tart – Comparing several recipes for apple fennel salad showed me variations with the dressing. There were several recipes that used mainly olive oil and lemon, but I wanted something tarty. Apple cider vinegar was the way to go, and using frozen concentrated apple juice was an easy shortcut. Whole grain mustard was added for flavor as well as texture. Is Thin Really In? – I came across this easy tip from The Purple Foodie in their version of an Apple Fennel Salad: “Cut everything thinly – the finer the cut, the better the chances of all elements of the salad coming together in a single bite, maximising flavour.” Wegman’s Apple Fennel Salad had thicker slices of apple, about 1/32 of an apple, and it still tasted great with the plump raisins and tart dressing, but I opted for thin slices. Refreshing and tart. If you ever had pickled green mango, this might taste something like it. The apples and fennel can be sliced the night before, just keep them in a ziploc bag–along with the raisins–until you’re ready to pour on the vinaigrette. Slice apples into quarters, remove seeds. Slice thinly and place in a large mixing bowl. Thinly slice fennel crosswise and add to apples. Stir in raisins, set aside. In a separate bowl or 2-cup measuring cup, combine apple cider vinegar, frozen apple juice, and stone ground mustard with a wire whisk. Put apple mixture in a gallon-sized ziploc bag, pour in vinaigrette and seal tightly, removing as much air without smashing apple mixture. Pour into a serving bowl and garnish with fennel leaves. Guests may season their own serving with salt & pepper. Serves 12-14. 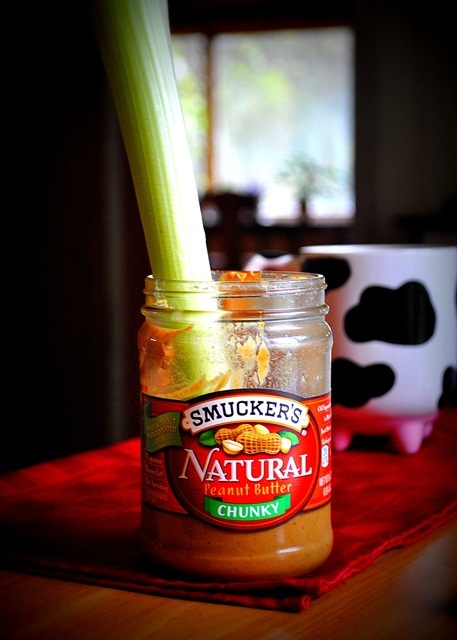 I love celery, and I love peanut butter! 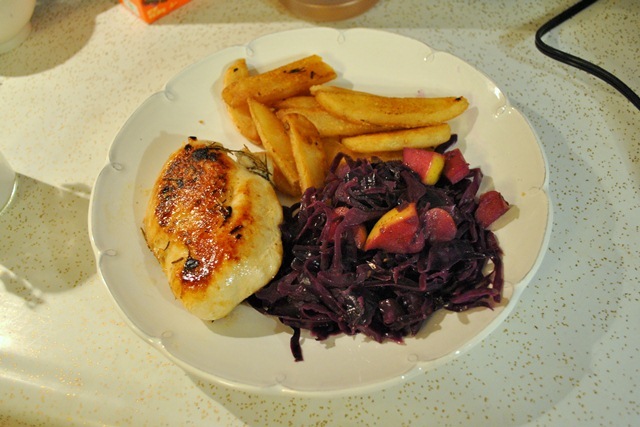 Mix plate: rosemary chicken, apfel rotkohl and steak fries. Where else can you get this eclectic mix of flavors but at home? 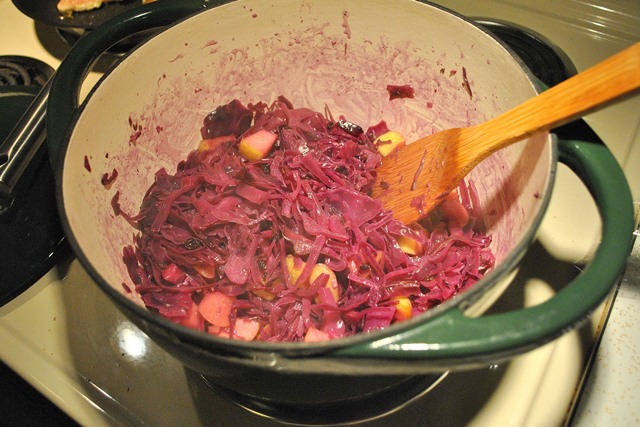 I recently experimented with red cabbage to make a German dish called Apfel Rotkohl (red cabbage and apples.) After looking at a few recipes I saw one from epicurious.com that sounded pretty good. I did make a few changes, like increasing the vinegar and sugar and adding apples and currants, and the end result was pretty good! Feel free to start with less sugar or vinegar, depending on whether you like it sweet, vinegary, or nice and mild. In a heavy pot, melt butter over medium heat. Add garlic and sautee for 1 minute. Add allspice, caraway seeds, salt, apple juice, and cabbage. Stir well. Cover and cook over medium heat for 15 minutes, stirring occasionally. After 10 minutes add apples, raisins, and agave or sugar. Stir then cover and cook for an additional 5 minutes or until apples are tender. Uncover pot, stir in half of apple cider vinegar. Cook until liquid is evaporated, about 2 minutes more. Remove from heat. If you want a definite vinegar taste, add remaining apple cider vinegar, stir. Serves 6. 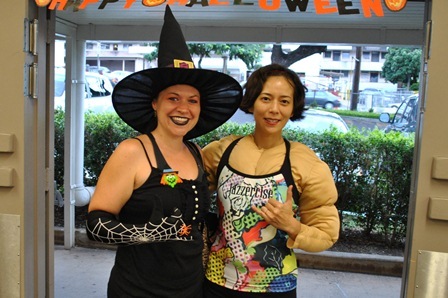 For Hallowe’en last year I was super buff! Have a great Hallowe’en, everybody! This afternoon my husband seemed to have a minor case of the blues. My way of cheering him up is usually with a nice shoulder rub (not like rubbing a pork shoulder with spices, but actually massaging his shoulders!) or with some kind of comfort food. The fridge was mostly filled with veggies, but we still had some turkey, cheese, and even some purple cauliflower I was going to use for some cauliflower-potato mash. So, sandwich night, it is! 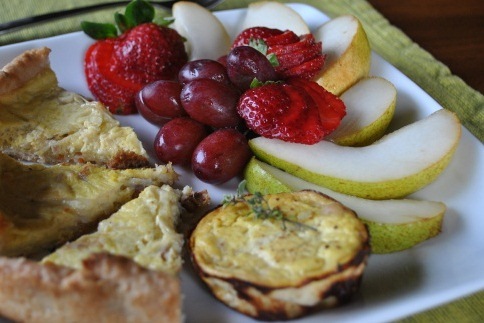 My grilled cheese sandwiches usually have the same thing: cheese, turkey, mushrooms, and slices of fresh apple. Today I added some bacon (another meat source in the fridge!) and piled it with some cauliflower-potato mash topped with more cheese. It’s an easy-prep meal that is filling, comforting, and still has a serving of healthy greens. 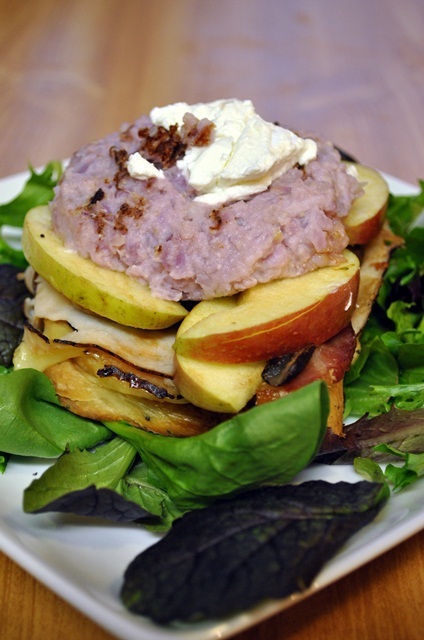 The apple slices cut through the salty savory flavors of the turkey and bacon. The mushrooms and cheese add more flavor and melty goodness, and the cauliflower mash is light but still creamy enough to give this open-faced sandwich a special “comfort food” quality that’s perfect for a last-minute midweek dinner. Enjoy! These sandwiches will fill you up, but the cauliflower mash won’t fill you out! Heat a large frying pan over medium heat, add bacon and cook for 2 minutes, moving around the pan to distribute the fat. Flip over bacon, move to the side. Add sliced mushrooms, sautee for 2 minutes. Put 2 slices of turkey together and add to pan, do the same with remaining slices, pushing mushrooms around to make room. Heat for 1 minute. Flip over turkey slices, pile on 1/4 of mushrooms and 1 slice of bacon on each 2 pieces of turkey, heat for 1 minute more. Carefully transfer turkey slices with mushrooms and bacon onto plate, set aside. Melt 1 tablespoon butter in pan. Add 4 slices of bread, top with cheese slices. After about a minute, add turkey slices with mushrooms and bacon to each slice of bread. Heat for 1-2 minutes more or until the underside of bread is browned. Transfer to a plate, set aside. In the same frying pan, melt 1 teaspoon of butter. Spoon 1/2 cup of cauliflower mash or mashed potatoes into pan, forming a mound (this will not hold together, but don’t worry.) Heat 1 1/2 minutes, carefully flip over, don’t worry if it spreads out a little. Top with a thin slice of cheese (or dab some goat cheese like I did for mine) and heat for another minute. Add one scoop of cauliflower mash to each bread slice topped with turkey & toppings. Serve on a bed of salad greens. The fresh ginger, sweet dates and tart cherries weren't enough to forgive the mealy texture of this Macintosh. My sister and brother-in-law were coming over as our first official guests for dinner in our new old home. Knowing he wasn’t a big chocolate fan, I decided to make an apple dessert that wasn’t too difficult but still looked impressive. This would be my first attempt at baked apples, and the recipe was pretty easy to follow, so nothing could go wrong, right? Wrong! 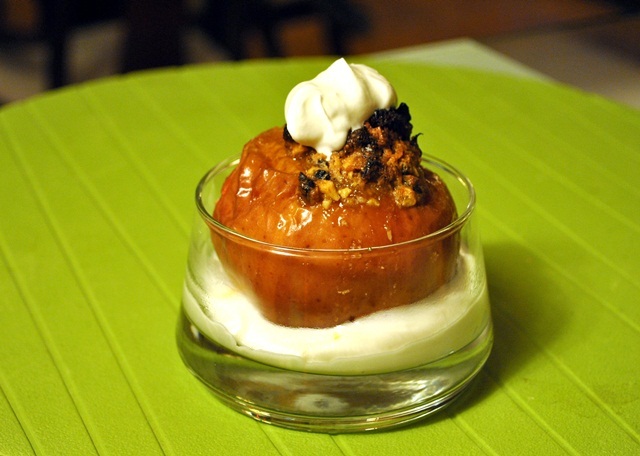 I stuffed my hollowed-out apples with a delicious ginger-spiked fruit & nut filling, baked them at the allotted time, plated them, took a few pictures, then sat down to sample my creation. Yes, I am not experienced with apples. After moving to New York I hadn’t realized how many varieties of apples were available, it was incredibly overwhelming. I had to resort to reading the little cards that labeled each variety. “Tart crisp, great for snacking.” “Sweet, like a pear.” “Great snack for kids.” In the end, I selected a bag of Macintosh apples because I’ve never tried them and they were only 89 cents a pound. And also because of the computer brand. :) Well, I like them fine raw. And I added some chopped apple to Ranting Chef’s Cinnamon Roll Cake recipe, which came out great. But as a baked apple? I don’t know what went wrong. Sigh…well, next time I try to make baked apples I’ll take by brother-in-law’s suggestion and go with Granny Smiths. But first, I’ll test it on my husband before serving it to guests.